These are great quality and well worth the price. They definitely block out the light when closed. I would buy more of these for more rooms in the house. Ensure restful sleep with this thermal-lined curtain panel that reduces noise and saves energy. Hang the panel by sturdy metal grommets for a beautiful finish to your room. Dimensions 108.0 In. X 52.0 In. I ordered two panels and they were completely different colors. I was out of town and now overstock wont' allow me to return. Bought these because the picture showed an aqua/seafoam colour, however they were more blue with some gray in them. The weaving was way too coarse for my taste and felt a little cheap. I'll go for a natural product like cotton, silk or linen next time. Great curtains. Very nice quality. 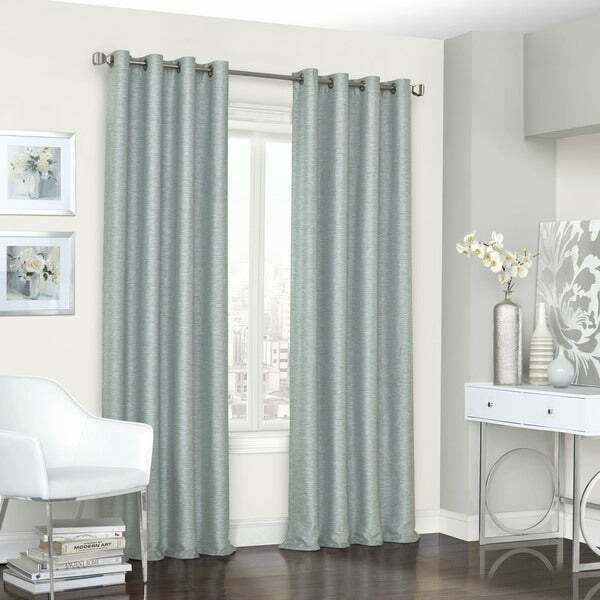 Beautiful curtains, keeps the room completely dark and also helps with temperature control. Highly recommend and would certainly purchase again! Beautiful and rich looking. Completely blackout. These drapes are very nice. They say they are blackout, but they actually let in a lot of light. I would recommend them to a friend but warn that they not a complete blackout drapes. Heavy curtains. They kept our bedroom warmer and definitely blocked out the light very well. Its nice to be able to nap in the middle of the day in a dark and peaceful room. Color is off from picture, is more grey-blue than dusty aqua. They are “ok”. Fabric seems on the cheap side. I wanted it to have a rough silk or linen feel. It didn’t. I love the color and the extra lenght makes the room look so much bigger! These work very well in our bedroom to block light, they look very nice also. They don't black out light completely as advertised! "What is the size of the grommet?" "how wide is each curtain"
Each panel is approximately 52 inches wide. "How wide is each panel??" "How many inches wide is the curtain "